What I dream of is an art of balance, of purity and serenity, devoid of troubling or depressing subject matter, an art that could be for every mental worker, for the businessman as well as the man of letters, for example, a soothing, calming influence on the mind, something like a good armchair that provides relaxation from fatigue. Imagine the derision this remark must have inspired from all quarters, and still probably does even now in the Age of Koons, especially over his “devoid of troubling or depressing subject matter.” From the point of view of those who saw art as a continuous shocking overthrow of prevailing artistic norms—modernism’s hollow legacy—this sentence sounds like blasphemy and backsliding, or worse. I think, in reality, it was a way of taking a stance against history, in a way. Matisse knew the risk he was taking, that he was setting himself at odds with the elements and theories he expected to be most celebrated in painting as it emerged in the 20th century. He asserts that he’s painting for the middle class, the businessman, the ordinary art lover, the loathed bourgeoisie—all of the people modernism was trying to outrage and unsettle and disturb. Instead, like Van Gogh, he was painting for everyone and anyone. That passage in “Notes of a Painter” was his refusal to be indoctrinated away from his own deepest instincts and aspirations—his faith in what art was meant to do. The man who, near the end of his life, told a nun that his aims as an artist were nearly identical with hers, as a follower of God, would have had a hard time recognizing a place for himself in the rhetoric of modern art as a destructive, revolutionary force. He was describing art as meditation, something that rises up from individual silence and joy, with no other agenda than to induce silence and love and joy in the viewer, and maybe even an occasional pleasure. Rules have no existence outside of individuals: otherwise a good professor would be as great a genius as a Racine. I am ready to admit that from a study of the works of Raphael or Titian, a more complete set of rules can be drawn than from those which suited their temperaments, and I prefer the most minor of their paintings to all the work of those who are content to imitate the Venus of Urbino or the Madonna of the Goldfinch. This sounds perfectly consistent with the modernist code: it was throwing out old rules and encoding new ones into each new image. Yet, I think for Matisse, any set of inherited or borrowed rules would once again lock the individual into a certain way of painting, a new school, the safety of the herd. And he never actually says the Impressionists were creating a new cage of shared rules: simply that they were following their own individual imperatives. In reality, there are plenty of rules embedded in Impressionism, and in any consistent body of work, and they are both limiting and liberating. His first sentence is the heart of it: rules in art have no existence apart from the individuals who generate them. The rules grow organically from the ungovernable passions of a practice, not the other way around. The rules are nothing more than hard-won personal habits an artist discovers at the end of the act of painting not before it begins. When I was in college, I’d already been painting for four or five years, and I was urged to go to art school, but I backed away from it and got a degree in English instead. I didn’t want to be indoctrinated into anyone else’s way of making art because I felt alienated by much of what was happening in painting in the 60s and 70s. Though I’ve come to love many of the painters whose work left me cold back then, at the time I distrusted the way theory had come to seem more important than instinct and feeling. I was too young and lazy to discern the deep individualistic passions in much of the work being done at that time, feeling loyal to a panoply of artists who had already inspired me, from half a century earlier: Braque, Chagall, Van Gogh, Matisse, Gauguin and many others. For example, I didn’t see in Diebenkorn a sort of fulfillment of what Matisse began in 1913 and then abandoned four years later, the monumental paintings he reworked for years that were so stunning in the Radical Invention show I attended at the Museum of Modern Art in 2010. (The bathers Matisse painted in those years are as much his calm reply to Demoiselles as they are an homage to Cezanne.) I didn’t warm to photo-realism, which Tom Wolfe celebrated as a cure for the oppressive influence of theory on visual art: it seemed at the time too spiritless and robotic, though I’ve come to love much of it since then. I didn’t even know Fairfield Porter existed, nor that he was exploring the stylistic space Matisse opened up in Nice, after he abandoned those large experimental canvases in which he internalized the challenge of Cubism and pure abstraction. All of which is to say, Matisse’s most significant period, for me, is the one least respected, the work he did while he was in Nice, when he reached back toward Post-Impressionism and backed away from the near-abstraction he had been obsessively perfecting for four years. It wasn’t that he was giving up on being a more integral agent in the art of his time; he was rejecting the notion that his historical context had to determine the way he painted. He was choosing himself over what was happening around him, market and critics and fellow painters and Surrealist poets and all other considerations be damned. 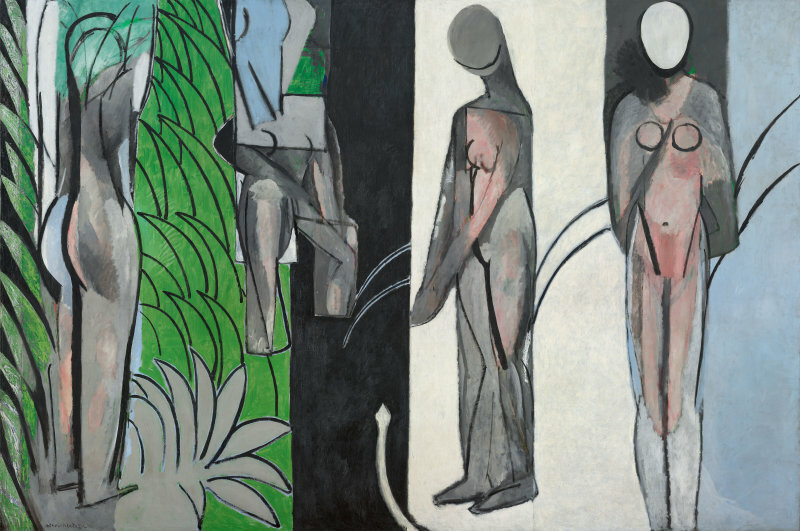 That meant, for Matisse in particular, he was increasingly choosing color and line over theory, over ideas, over the notion that art rises up out of concepts instead of inchoate feeling embodied in physical labor and visual perception. Color became his medium, until he was essentially shaping pure color itself with a pair of scissors at the end. Those later cut-outs are the most joyous work any artist has ever done, and I never want to look away from them, but for me they aren’t as substantial or lasting as the modest-seeming interiors and still lifes and figures he did in Nice, which may seem to some critics little more than odes to pleasure. (He set himself up for that with his line about easing the life of the businessman in his armchair.) Instead, they are melodies composed with color, a balance of his desire to both represent the world and yet be just as obsessed with the physical qualities of a painting’s surface and of color for its own sake. And yet, for all that, they feel natural and effortless. More significantly, in each one, you sense what it was like to be this particular human being, at this time of day, in this warm and light-filled place, paying attention to how it felt to be alive, mindful of everything around him and within him, and trying to pass all of it along to anyone else who would pause long enough to notice. Great article Dave. It’s a noble thing to paint for people and to bring a little peace and pleasure into people’s lives. Of course there is a place for analysis of painful sides of life too, but I wish we’d make more room at the table (or wall of the museum and page in the history book) for art that lives and experiences the magic in average life too. The thing about that is personalities that just want to live a peacefully is they don’t grab as much attention as those who want to address unrestful emotions. Squeaky wheel – etc. It would be interesting to live long enough to see perspective on history of our time change as it inevitably will. Who knows what future art lovers will look back on and be deeply moved by? I’ve never hear of Louise Matthausdottir so looking her up now. Agree on all this Sarah. When I was a member at Viridian Artists we used to talk about “the art world” as something that really doesn’t have definite boundaries, though we all have a sense of what those words mean and it often has negative associations: it’s economically driven, it’s elitist and exclusive, it’s cynical, etc. In reality, there’s room for anyone and anything in it, though money makes it appear otherwise.